It’s going to be a lot harder to escape Broodmother after the latest Dota 2 patch. The numbers support that thesis: her web AoE has increased by about a third, her cast range nearly doubled, and she’s now able to move about her web unhindered by cliffs, trees and other hazards that trouble non-arthropods. She’s about to become a much more common sight along the lanes as a result. 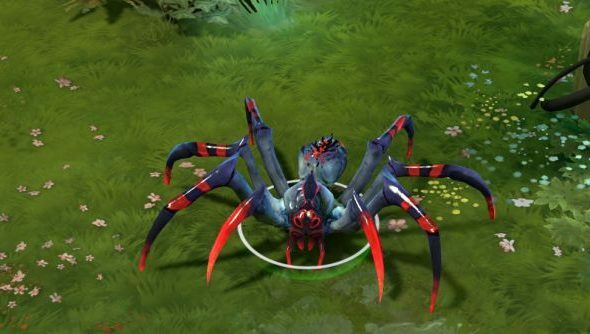 Unfortunately, a proportion of Dota 2’s players are arachnophobes, and the game doesn’t take well to panicked Alt+F4s. A post on the Dota 2 Reddit on Saturday prompted a flood of interest, sympathy, and condemnation of hammy David Arquette feature Eight Legged Freaks. “With the new patch I expect a lot of broodmother and everything from the webs to the heroes model to the freaky voice terrify me and i’ll be taking an abandon and low priority every time she’s chosen against me,” said the initial poster. As it happened, no such mod existed. But it does now. Within hours, dataminer and community mainstay Cyborgmatt had dedicated his Twitch feed to the creation of an ‘Anti-Spider Mod’. The result was a quick cosmetic fix that replaced Broodmother’s many-legged visage with that of a decidedly non-spindly frog. Which games have set off your irrational fears in the past? Thief 3 played on my disliking for reanimated nightmare asylum people, I remember.